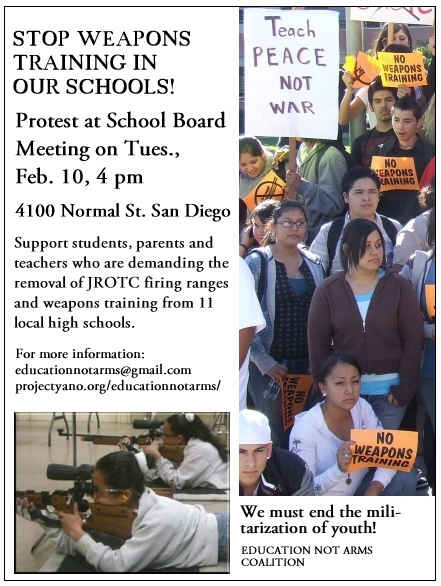 Intro by Rocky Neptun: Dear Friends…On Tuesday, February, 10th, San Diego students need you support. 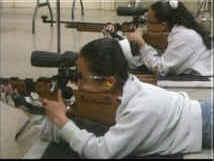 Please come to the School Board meeting, where youth of conscience throughout the school district will be demanding that shooting ranges be eliminated from our school campuses. Several new Board members have been elected and they might listen to reason…or at least, to their students and supporters. The gathering at the Education Center, 4100 Normal Street, San Diego, will begin at 4 p.m. For more information, contact educationnotarms@gmil.com. If you think that the militarization of our youth is just an intellectual concept or catchy phrase, please read the following article by me posted on the MediaLeft website…..
Kat once told her mother about a recurring dark nightmare, where she saw her beautiful, only son dragged up the steep temple steps by half-naked wild men chanting accolades to their deity of war for victory. As they slit his throat, blood ran across their chests, down their bellies, onto the filthy stone steps – while the watching crowd below cowered in fear. She always woke screaming. Her life´s work, her son, Jason, was, indeed, murdered by the vicars of war last year. He stepped on a land mine and his legs were blown away from his body…blood spilled onto Iraqi sand so that modern militarism, its madness, its insanity of youthocide, controlled by the military-technological complex, fed by contemporary priests of war, politicians, can profit. In a tradition stretching back thousands of years…she, at first, accepted her womb´s love lost, slain for the supposed good of the clan….a patriotic mother, submerged in the social lie. Over the years, she had struggled to protect him from the hard streets of her City Heights neighborhood. Working two jobs to secure a safe apartment, buying him a computer, nice clothes as an incentive to attend school, sports events and music lessons to keep him away from the roaming gangs who fill the void of poverty and nothingless. Yet, in the end, the predators got him…the vile ones, far more ruthless and sinister than the Crips or the Bloods. Like some insistent pimp stalking a potential prostitute, they went onto his high school campus, promising huge amounts of up front cash, as well as a secure future, if he merely learned to bend over and follow orders. Without the money for college, like thousands of other fatherless, poor kids, she knew her son faced the bleak prospect of either jamming burritos at Taco Bell or joining the local gang pushing crack in the alley behind the 99 Cents store. She watched in silence as her beloved son went off to kill other beloved sons. She was voiceless and powerless against one of the greatest evils on Earth today – the U.S. military. Kat is furious with the politicians who sacrificed or failed to protect her son. She is bitter against her clan…Americans who worry more about plummeting property values and the so called ¨sanctity of marriage rather than poor kids selling their souls and very lives to the military conspiracy. ¨She now hates society in general and people in particular…she want´s no publicity and plans to escape to a job in a remote vacation lodge, smack dab in the northern Minnesota forest. …..I know her loss, her sorrow and plans only because her mother is a member of our Renters Union. ¨´My grandfather was killed in Korea, an uncle in Vietnam, now Jason is gone….do you honestly imagine that some smooth talking, fancy pants law professor from Chicago is going to bring down the killing machine?´¨ she spat at me. ´¨He will just tinker, pretend to change things, fearful of its power, while the military system just cranks on….poor kids in military uniforms and body bags, rich kids in designer suits and Hummers…..nothing hard will change, they won´t let him, just like Martin Luther King´¨ Her anger and pain separated us like a concrete wall. I stood stiffly, helplessly, without words, without excuses. How could I apologize for not taking on the military-technological complex…did my tax checks have Jason´s blood on them, my interest gained at the bank? What was my excuse for not showing up when the military´s right wing allies took control of our local school boards? Did all my posturing, marching, letters to the editor, outrage and tinkering change a damn thing?How many more Jasons must be sacrificed on the alter of war before I have the courage to sacrifice all for peace and justice? How many more young student minds and consciences warped and twisted by the militarization of their education, their futures tethered to the ways of violence and distant wars? ¨´Why did they teach my son war?´¨ she wept as she staggered backward toward an idling transit bus, throwing a half eaten apple toward the poster of the American flag in a store window.